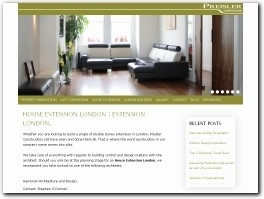 Preisler Construction Ltd. is a general builder working out of central London, carrying out predominantly house extension, loft conversions and larger refurbishment in the residential sector. CJ Sports specialises in providing quality sports equipment for schools, sports clubs and councils. We offer installation, construction and maintenance. Here at Wigan Skip Hire, we offer skips and tipping services. Call us today on 01942597358 or fill in our online enquiry form and get a quote on your Hiring of a Skip. Leyland Skip Hire offer Tipping services as well as Skip Hiring Services. Offering Different sized skips to suit your Needs, we offer 2, 4, 6, 8, 10 and 12 yard Skips. Here at Preston Skip Hire, we offer Skip Hire and Waste Tipping within the surrounding area of Preston. Offering Different Skip sizes, we offer Skip Hire for Small and Large Waste Removal jobs. Chorley Skip Hire offers Commercial, Domestic and Industrial Skips as well as Waste Removal within Chorley, Duxbury and Surrounding areas. We tailor our services to suit your needs of the customer. Here at Skips Preston, we offer Skip Hire Services, Waste Management, Construction and Household Waste within Preston and surrounding areas. At Bolton Skip Hire, We offer Commercial, Industrial and Domestic Skip Hire as well as Waste Tipping Facilities within local areas. Our Local Areas include Wigan, Chorley and Leigh. Plasloc has been developed for use as segregation partitioning in the most challenging commercial environments. It is a freestanding PVCu internal and external cladding system designed for a quality, quick installation and easy removal. Lostock Skip Hire offers Skip Hire Services within the North West of England. Offering Industrial, Commercial and Domestic Skip Hire as well as Waste Tipping Facilities. AEG Teachwall specialise in providing acoustic movable walls and sliding folding partitions. We offer Installation, maintenance and manufacturing services for movable walls, sliding walls and concertina walls. Adlington Skip Hire offers skips in various sizes, we also have roll on and roll off containers that you can use to store waste and excess materials before being taken to our tipping facility. A.M. Irvine Slating Limited provides complete roofing services for private and commercial customers throughout Aberdeen and Aberdeenshire. JHS Health and Safety Consbultants work for scaffolding and building contractors. We design our builders and scaffolding health and safety services to suit small and also medium size firms. From classic, modern, contemporary staircase to stunning and elegant centerpieces. Whether they be replacement staircases or complete renovations with a variety of choice in materials. Randles Roofing and Building Services are a team of expert contractors who specialise in roofing, roof repairs, building services and guttering across the North West and West Yorkshire. Any seasoned investor will tell you that finding the right contractor is critical for a successful renovation. The project may be a flip or rental, but in either circumstance the disposition is irrelevant. Lone Star Safe Rooms started its business in 2012. It’s partners, Mike Carman and Chris Hooser have been associated for over 25 years as vendors for the new home builder and existing residential markets. SRI Contractors Ltd is a reliable and well accredited company with a background of years of experience. Founded by a team of qualified professionals and skilled builders. number one. We provide scaffolding hiring services by experienced scaffolders and have more than 60 years of experience in this industry. Full service construction company, Commercial and residential,Building, Renovations, Granite counters, Decks, Siding, All work guaranteed and Licensed. DIY Furniture made of pallets: Beds, desks, sofas and other furniture made from pallets. Step by step guides, advice on tools and best practises, finding, choosing, and preparing pallets.